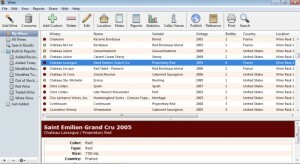 When I initially started collecting wine I decided that I needed some sort of cellar tracking software to keep track of all of our recent purchases. I was interested in something that would keep track of how many bottles I had on hand and each wines value. I also wondered if it was possible to keep track of expiration dates. Yes, some wines do cellar better than others. For example, most people drink a Chardonnay when it is young (2011) and a Cabernet Sauvignon (2005) many years after it is bottled. I was seeking a software package that would be flexible yet portable. As I was reviewing products I had a small checklist. 1 – Supports Windows (I’m sure my Linux friends are saying what?). 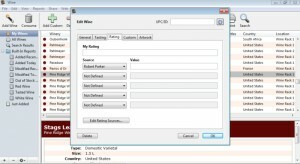 2 – Able to export to a CSV file format if I want to upgrade to another product. 3 – Able to print the entire inventory to share with Chris or my insurance agent. 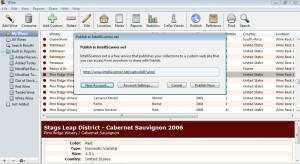 4 – Able to upload the inventory online to be shared or as a backup. 5 – Scanning was optional. It would be nice to be able to scan the bottle and all of the details were added to the database automatically. With the requirements mentioned, I started searching the Internet. After many possible solutions, I decided to buy a package from Intelliscanner.com. 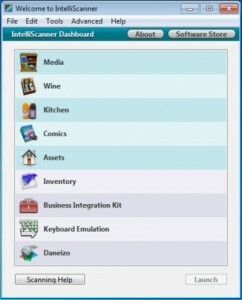 I purchased the Intelliscanner mini 100. It only made sense that at the same time we purchased a small netbook PC to install the software specifically to track our wine. Installing the software and the USB driver was relatively easy. When you run the program the user interface pops up. 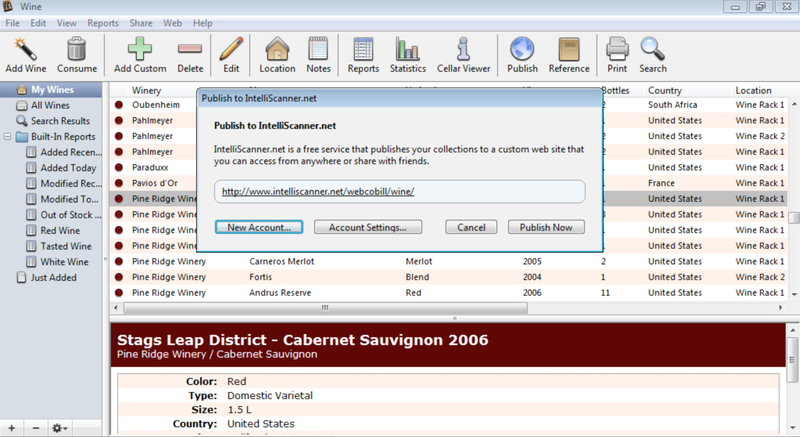 You need to click on the wine tab to open the cellar tracking software. 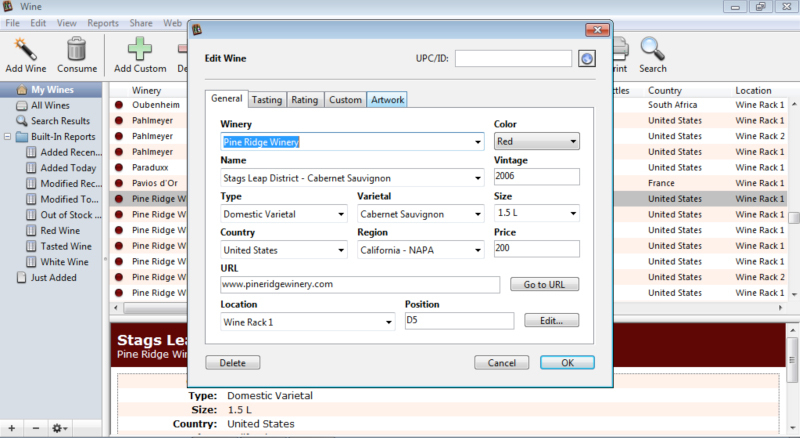 The first time you click on wine it will prompt you for a serial number. I was now ready to start the scanning software. As luck would have it, most of the wines we’ve purchased from wineries do not have the barcodes on the back of the bottle. We also found that half of the wine bottles that did include bar codes were not recognized. I was bummed so it was time to move to plan “B” and enter the wine manually. Entering the bottles manually is not too hard. The software is very simple to use. There were many sections to add for the type of wine red or white varietal (Cab, Zin, Merlot, other), the name of the winery, year, price each, website, etc. After many hours of entering the bottles of wine in our inventory, I was finally done! 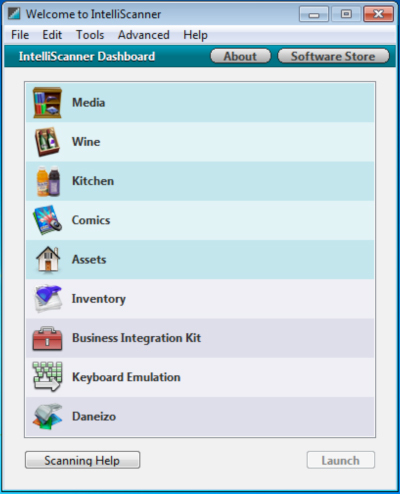 Once complete it was time to publish the database to the Intelliscanner website. Uploading required a username and password. Once this is all done, the cellar tracking software uploads it for you. I felt exhilarated and was excited to show Chris the product! I printed a list of the wine inventory so she could see what we had and where the location of each bottle was located. Without this list, she had experienced trouble locating where her favorite varieties were while I was out-of-town. She needed simplicity when having her friends over! 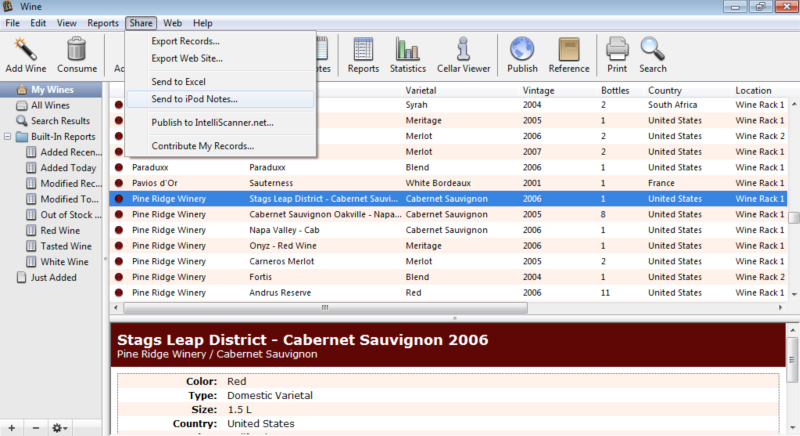 One thing you have to keep in mind once you decide to have cellar tracking software is to make sure you keep updating the database every time you remove bottles or adding bottles to our cellar. After many years of having the software, I can say I have only lost track of a couple of bottles. I am sure that’s because we were having a little too much fun with friends and I did not keep the bottle when it was empty to later document. I guess it could be possible that I did not make a note when we took a bottle along to a friend. If you discipline yourself, it’s worth the investment in time and money. Just to be clear, I am not paid nor suggest you choose the brand Intelliscanner software. Make sure you decide on what you want to accomplish. Start by creating a list of your needs and wishes, and then start doing your research. 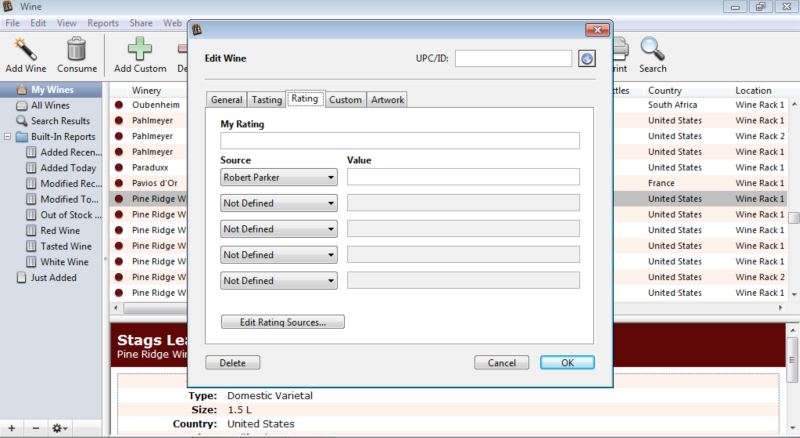 I see on the IntelliScanner website that this software can track “drink by” dates and suggest what wines you should be drinking now. My question for you, as a user of the software: does the software generate these drink by dates automatically or do you have to manually input them? 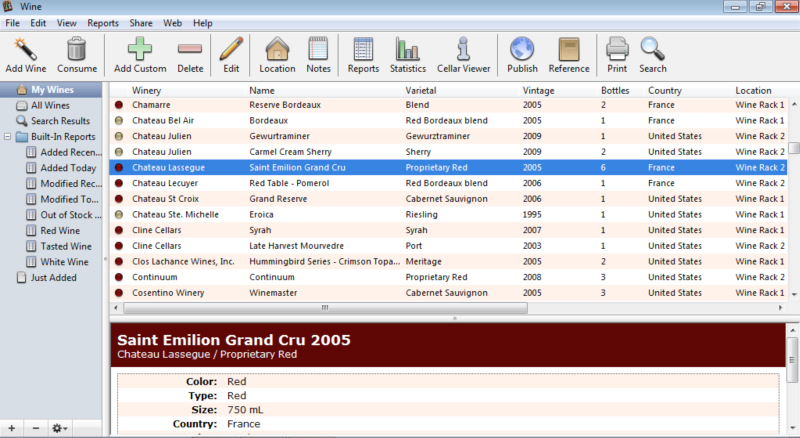 Have you found this feature useful in helping you keep track of what wines are at maturity? Thanks for the helpful write up. I should add: I’m trying to decide between this product and Cellar Tracker for my father’s cellar. Any input that you have is appreciated. 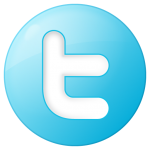 My recommendation is review the features and online comments of both applications. My experience with the bar code reader is many bottles of wine do not include the bar code. The other issue is the the wine is not correct after I scanned the bottle. The bar code is only as good as the winery who updates every year. My version is many years old. With that said, I have to manually add drink by dates. If the newer version can track the drink by dates automatically I would ask them how. Wines are not made the same and the wine maker or winery generally has an idea what the drink by date is. Many times the tasting notes will include drink by dates.